Audrius Ambrasas tends to be demonstratively indifferent to artificial architectural honours, although one of the most famous contemporary Lithuanian architects could lose sight of the number he has received. His office building “Hanner”, (with its 15 floors taxi drivers have nicknamed it the “razor”) became the first high-rise in Lithuania in 2001 after the declaration of the second independence. A few years later, Ambrasas built the business and trade complex “Europa” in Vilnius. With its 33 floors it is now the highest building in Lithuania. The list of his projects could be continued at will, although Ambrasas himself does not emphasize the prominence of his administrative or business projects. However, his eyes sparkle when we start talking about his latest project – the Rupert Art Incubator – which has already gained enormous attention since opening in 2013. 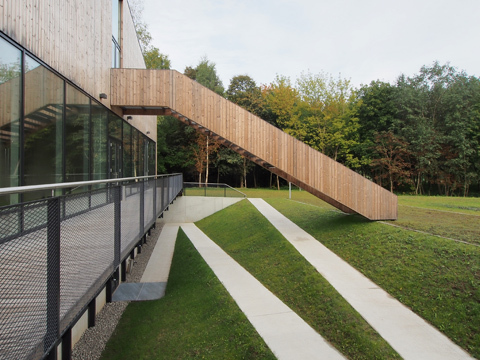 Today, the Rupert Art Incubator is the largest art and culture building created and inaugurated in Lithuania in the last 20 years. 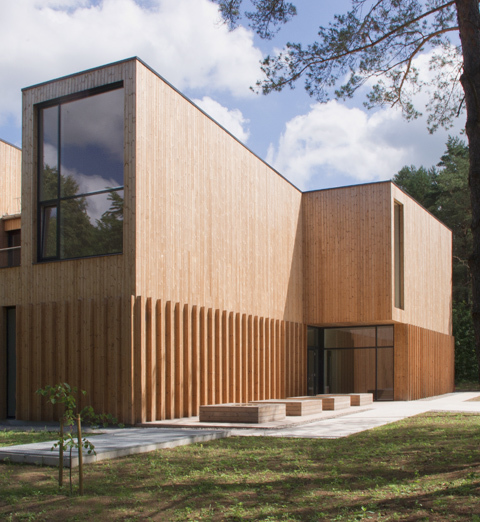 Not that this is the reason why it has already become an exceptional phenomenon of the modern Lithuanian architecture and Ambrasas’ own favourite baby. 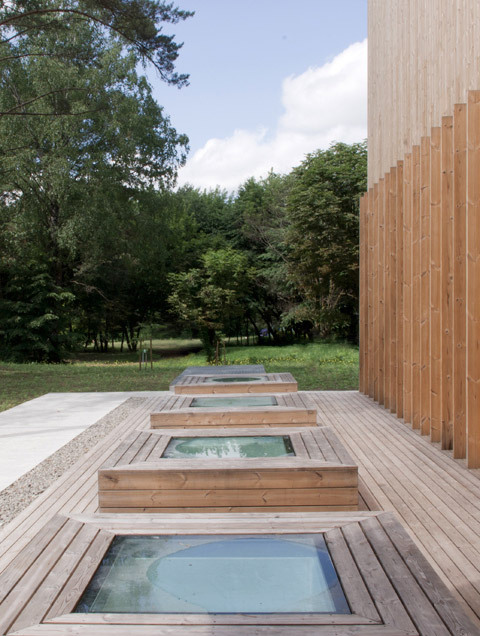 The Rupert Art and Education Centre was built in an idyllic location in Vilnius, Lithuania’s capital. It is a recreational urban zone of incredible beauty near the river Neris, much favored by the inhabitants. A few decades ago all there was here was a small grocery store, and visitors to the beach and locals popped in to buy ice-cream and lemonade. This was one of the reasons why during the construction of the Rupert Art Incubator the locals still sincerely thought that a new supermarket was being built. This was far from the case, as Rupert is an open, dynamic, multifunctional art and educational space for artists and art lovers. And it seems that no better location could be found for it. Vilnius has set quite strict architectural design rules, irrespective of the type of building. Given the restrictions on height and total space area, the art incubator could at best have only be replaced by a one story building with a roof line not higher than 10 metres and no larger than 2,096 square meters. Only an architect with an exceptional feel for his trade would see such strict design rules as a beneficial challenge and an opportunity, encouraging astonishing results. The type of the building defined the functional zones and their location inside it. An open exhibition hall with a library and administrative wing are arranged on the 1st floor; exhibitions, seminars and lectures are held there. The 2nd floor is reserved for professional artists, as is the basement, which also boasts a computer art workshop. 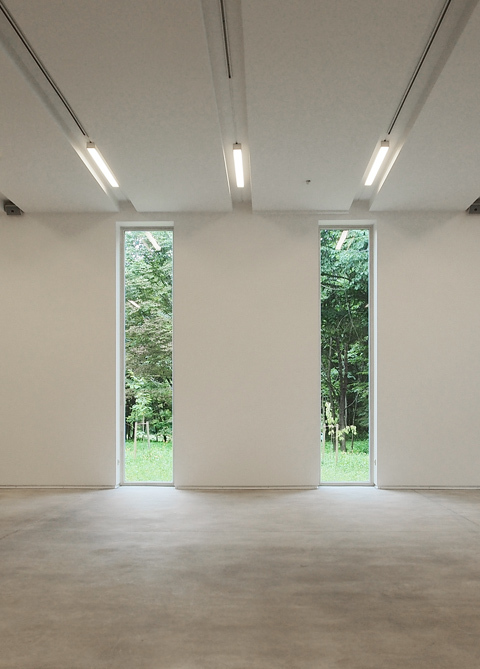 Though special skylights ensure sufficient natural daylight, this is probably not that important for the representatives of computer art. By contrast, the workshops on the 2nd floor have large windows affording an outstanding panorama. 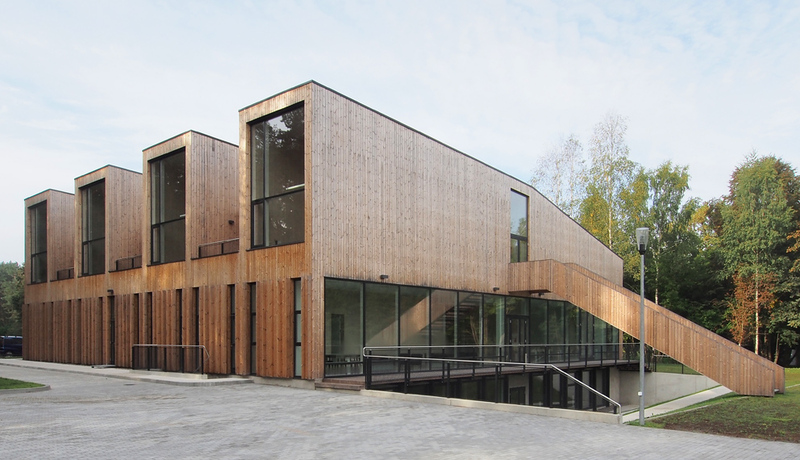 Lithuanian as well as foreign artists attending special art programs reside in these studios. The main themes the project addresses are the environment of the seaside resort and the mysteries of art. The massive studio windows on the 2nd floor allude in a modern idiom to the wooden villas still standing in this urban district. Residing artists often say they feel like they were on holiday. During the summer they are especially tempted by special stairs, which lead from the studios on the 2nd floor straight down to the beach. Hopefully, this passer-by or holidaymaker will be braver next time as the openings show the interior to be very democratic and cozy. The architect chose pine-tree bleached panels for the walls, bleached ashen parquet for the floor, and in the basement opted for polished concrete floors. That is almost all that need be said about the interior, yet that in itself is a clear advantage. The furniture in the art incubator needs special attention. Probably one of the most famous Lithuanian designers Nauris Kalinauskas created or adapted strictly ecological and sustainable office furniture systems specially for this project. The style of the tables and cabinets of the “75” series is clearly 1980s, and the items are all kept amazingly simple: The table is 75 cm high. 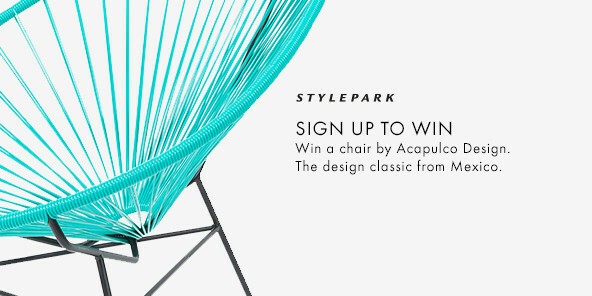 The furniture is produced from plywood and solid ash with no plastic or metal elements. The “+” book shelf system has unique joints meaning that specic shelf sizes can be created using separate plywood modules without any screws. The chair “004” was again purpose-created by the designer for this project, but has since become a bestseller of modern Lithuanian furniture design. The kitchen zone also has its own specially designed furniture: a system named “Loft”. While there is still no concert hall being designed in Lithuania it will come as no surprise that this is a dream of Audrius Ambrasas. A dream I hope will one day come true. Three chairs and the Lithuanian design: But what role does design play even in a small country between Scandinavia and Russia? 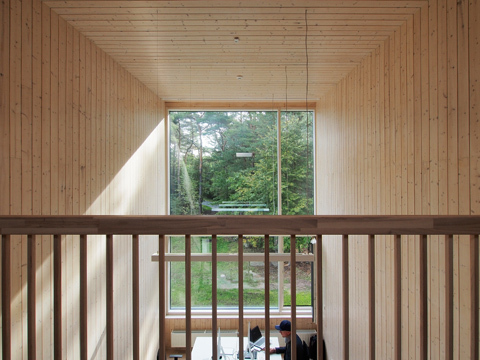 The large studio windows provide optimal exposure of the workspaces. Interior and exterior space are nearly everywhere in the building in relation to each other. 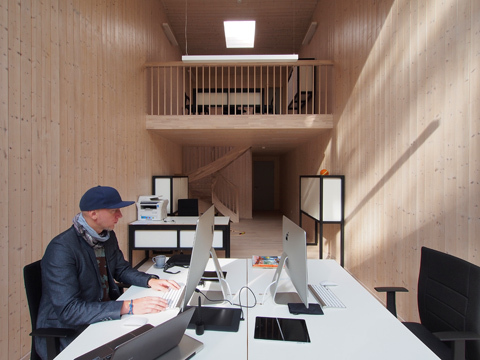 Nauri Kalinauskas, one of the most famous Lithuanian designers has developed strictly ecological and sustainable office furniture for the Rupert Art Incubator. 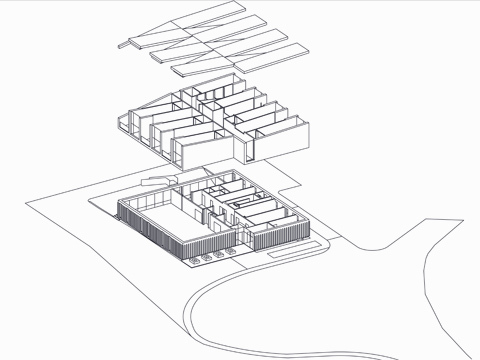 In the exploded view, the structure of the studio building’s different levels is visible.